The Early Investing team attended the Cannabis Science Conference last week in Baltimore. The conference had different tracks and sessions for various aspects of the industry, including growers, medical professionals, scientists, researchers and more. Speakers gave presentations on everything from cultivation techniques to medical cannabis for seniors. I mainly stuck to the medical presentations. And over and over again, I heard about the healing power of cannabis. A number of different medical professionals said they were treating patients of all ages for a wide range of illnesses – from Parkinson’s disease to anxiety – with a variety of different cannabis products, including CBD oil. Treatments had varying levels of THC (tetrahydrocannabinol) and CBD (cannabidiol). The speakers said they were seeing some impressive improvement in their patients. And results from a recent study in Israel back them up. 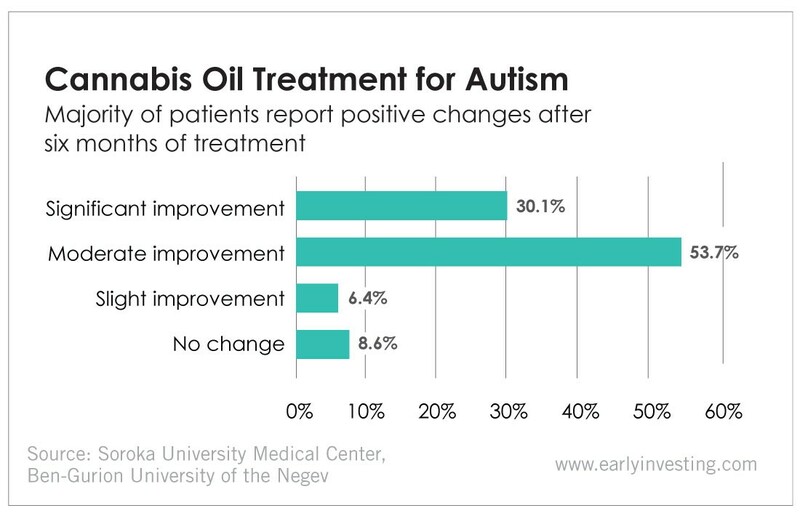 Researchers at Soroka University Medical Center and Ben-Gurion University of the Negev have found that cannabis oil is an effective remedy for patients with autism spectrum disorder (ASD). They began a study with 188 ASD patients (all children) after learning of anecdotal evidence that cannabis can have therapeutic effects for autistic patients. Patients reported a number of different symptoms, including seizures, rage attacks, anxiety, depression and cognitive impairment. After six months of treatment, 155 continued the cannabis treatment. Of those, 93 had parents that responded to the researchers’ questionnaire on their symptom changes. Thirty percent of respondents reported significant improvement in their symptoms, while 54% reported moderate improvement. Only around 15% reported little or no improvement. Overall, more than 80% reported a significant or moderate improvement in their children’s symptoms. “Cannabis in ASD patients appears to be a well-tolerated, safe and effective option to relieve symptoms associated with ASD,” the report said. Speakers echoed this exact sentiment throughout the conference. Cannabis is nontoxic, well-tolerated and safe. Even when it’s ineffective, it doesn’t harm patients. So there’s no risk in trying. And for some presenters, like Janie Maedler, cannabis has changed lives. Her daughter Rylie developed aggressive bone tumors at age 7. Maedler sought out cannabis as a nontoxic treatment option – and it worked. Rylie’s bones began regenerating. The tumors shrank and were eventually removed. Rylie said the treatment helped her feel “normal” again. Now Rylie and her mother run a nonprofit dedicated to helping sick children achieve a better quality of life. Among other things, they advocate for more treatment options for children and support research of less toxic therapies. And Rylie is the founder of her own CBD production company. It’s encouraging to learn that cannabis helps ASD patients and children like Rylie. They’re a reminder that we need to continue exploring cannabis’ medical properties. Because we’ve only just started to scratch the surface of its potential. 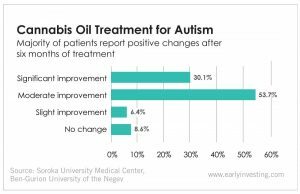 The post Study Finds Cannabis Helps Treat Autism appeared first on Early Investing.